WELLSBORO – Mary H. Sherant, 94, a resident of the Green Home and a former long-time resident of Arnot, died Tuesday, Oct. 5, 1999 at Soldiers and Sailors Memorial Hospital. Her husband of 60 years, Leo Sherant, died in 1983. She was a member of St. Mary’s Catholic Church, Blossburg. Born Oct. 4, 1905 in Leetonia, she was a daughter of Michael and Mary Adamski.Surviving are two sons, Chester and Frank, both of Arnot; a sister, Viola Borak of Elmira Heights, N.Y.; six grandchildren; and nine great-grandchildren.She was predeceased by a son, Daniel; a sister, Bertha; and a brother, Joseph. A prayer service will be at 9 a.m. Saturday and Zwicharowski’s, 314 Granger St., Blossburg, followed by a Mass of Christian Burial at 10 a.m. in the church, Blossburg. Interment will be in the parish cemetery. Friends may call at the funeral home from 6:30 to 8:30 p.m. Friday. A vigil service will be at 7:30. AHEARN, Edward - Arnot, Jan. 27. Edward Ahearn, a lifelong resident of this place, died at his home last week from a stroke of apoplexy sustained the week before. Mr. Ahearn is survived by his widow, four daughters – Mrs. Peter Nelcoskie, Hannah, Genevieve and Arlene, and one son, Edward, of New Haven, Conn. The funeral was held from St. Matthew’s church Thursday morning. Rev. M..J. Kelly celebrating high mass. The remains were taken to Blossburg for interment in St. Andrew’s cemetery. Wellsboro Agitator, 29 Jan 1919. BESCANCENY- Robena, The remains of Mrs. Rose Robena, a former resident of Blossburg, who died after a long illness at her home in Rochester, were taken Thursday evening to the home of her son Francis Robena, at Arnot. Funeral services were held at 9 O'clock Friday morning from St. Matthews Catholic Church at Arnot, Rev. M. F. Carrigan celebrated a high mass of requiem(?). Interment was made in the St. Andrews Cemetery, Blossburg. Her husband Amos Robena , died several years ago. She is survived by two sons and four daughters. Mr Francis Bezonocey ( BESCANCENY) , one of Arnot's oldest and most respected citizens, died last week Tuesday, he was born in France and was in the 79th year of his age. James M. Brann, age 90, of Antrim, died Thursday, Nov. 1, 1973 at Wellsboro. Requiem Mass was held Saturday at St. Peter's Catholic Church, Wellsboro, with Rev. Thomas J. Hannigan officiating. Burial in Andrews Cemetery, Blossburg. Recitation of prayers on Friday at the funeral home. He is survived by one nephew, Austin Boyle of Chicago. He was a communicant of St. John's Catholic Church, Antrim; 50 year member of the Knights of Columbus and retired post master of Antrim. WILLIAM A. CASSELBERRY, U.S. Air Force Veteran serving in the Korean War age 69, of West Hill, Covington, PA, died Monday, May 31, 1999 at the Bath V.A. Medical Center, New York. Born October 3, 1929 in Canton, PA, he was the son of Cloyd and Mary Spalding Casselberry. He had been employed as a heavy equipment operator for Antrim Mining. Mr. Casselberry was a United States Air Force Veteran and had served during the Korean War. He was a lifetime member and Past Commander of the Mansfield V.F.W. Post #6757 (Canoe Camp). He belonged to the Blossburg V.F.W. Post #8730 Supreme Sacrifice, The Hillside Rod and Gun, The Arnot Sportsman’s Club, and the Morris Run American Legion Post #167. Surviving are his wife of 43 years, the former Bonnie R. Wakely; his son, Michael (Donna) Casselberry of Covington; 2 step-daughters, Susan Womer of Montoursville, PA, and Lou Brown of Mansfield, PA; his sister, Judith Kelly of Virginia Beach, VA; 6 grandchildren and several nieces and nephews. Preceding him in death were his daughter, Vicki Lynn Casselberry; his brother, Max Casselberry; and his sister, Donna Hick. Friends may call Thursday from 66-8 PM at the Wm. Zwickharowski Funeral Home, 314 Granger St., Blossburg. Funeral Services will be held there Friday, June 4 at 10:00 AM with the Reverend Archie Cruikshank, Pastor of Blossburg and Covington United Methodist Churches, and the Reverend Kenneth Seegar, Pastor of the Blossburg Area Catholic Community Churches, co-officiating. Interment in St. Andrew’s Cemetery, Blossburg. The family will provide the flowers. Memorial contributions may be made to North Penn Home Heath/Hospice, PO Box 8, Blossburg, PA. –Elmira Star Gazette. died Friday, Feb. 4, 2011, at Soldiers and Sailors Memorial Hospital, Wellsboro. Born in Arnot, Pa., she lived in Blossburg most of her life with her beloved husband, Bill. Mary and Bill celebrated 54 years together having married in 1957. Mary is survived by her husband Bill, sister Margaret Horton of Mansfield, and several nieces and nephews. Mary was the daughter of John "Fuzzy" and Josephine Collins, since deceased. She was preceded by brothers, James Collins, killed in WWll, and John Collins, Galeton. Following graduation from Blossburg High School, she went to work for J.P. Ward Foundry as a secretary, where she retired after many years. She was a life member of St. Andrews Catholic Church and the Altar and Rosary Society. In accordance with her wishes there will be no viewing. A Mass of Christian Burial will be celebrated at 10 a.m. Tuesday, Feb. 8, 2011, from St. Mary's Church, Blossburg, with Father Jacek Bialkowski as celebrant. Interment will follow at St. Andrews Cemetery. Funeral arrangements are under the care of Freeberg Funeral Home, Blossburg. Wellsboro Henry “Hank” Louis Peris 96 years formerly of West Second St., Corning, NY died Friday February 4, 2011 at the Absolut Care of Endicott. Funeral services were held on Saturday for Mrs. Mary C. Mays, 80, of Blossburg, who died Thursday, Oct. 4, 1973, in Soldiers and Sailors Memorial Hospital, Wellsboro, following a lengthy illness. She was born in Arnot on Aug. 2, 1893, a daughter of Thomas and Mary Lynch Connolly. Mrs. Mays was a member of St. Andrew's Catholic Church and its Altar and Rosary Society. She was also a member of the auxiliary of William B. Wilson American Legion Post 572 and a charter member of the Supreme Sacrifice Auxiliary of Veterans of Foreign Wars Post 8730. Surviving are three sons, John and Thomas, both of Blossburg, and Paul of Wellsboro; two daughters, Mrs. Virginia Hughes of Morris Run, and Mrs. Rita Mays, at home; two sisters, Mrs. Monica Applin, of Elmira, NY, and Mrs. Agnes Losieniecki, of Blossburg, four grandchildren and two great-grandchildren. The Rev. Robert L. Nealon, her pastor, officiated. Burial was in the church cemetery. age 80, of 309 Ruah St., Blossburg, Pa., Thursday, Oct. 4, 1973, at the Soldiers and Sailors Memorial Hospital, Wellsboro, Pa. Friends are invited to call at the Auld Funeral Home, Blossburg, Pa., Friday 2 to 4 and 7 to 9 p.m. Prayer service there Saturday, Oct. 6, 1973 at 9 a.m. followed by Funeral Mass in St. Andrew’s Church, Blossburg, Pa. at 9:30 a.m., the Rev. Robert Nealon, celebrant. Burial in St. Andrew’s Cemetery. Survived by sons, John and Thomas Mays both of Blossburg, Pa., Paul Mays of Wellsboro, Pa.; daughters, Mrs. Virginia Hughes of Morris Run, Pa., Miss Rita Mays of Blossburg, Pa.; four grandchildren; two great-grandchildren, sisters, Mrs. Monica Applin of Elmira, Mrs. Louis (Agnes) Losiehiecki of Blossburg, Pa. She was a member of St. Andrew’s Church and the Altar and Rosary Society of the same church. She was also a member of the William B. Wilson American Legion Auxiliary and a charter member of the Auxiliary of the Supreme Sacrifice Post No. 8730 of the Veterans of Foreign Wars, Blossburg, Pa.
Marie E. of Mansfield, PA Age 84, died on Thursday, April 21, 2005, in Conyers, GA. She was born on July 14, 1920, to Ralph and Hildred Ford Dann. She was the widow of John W. Cunningham, Sr. She was a graduate of Mansfield High School, Class of 1937, and an alumnus of Mansfield State Teachers College. She married Mr. Cunningham in 1941, and they became parents of nine children. Marie was a member of the Holy Child Catholic Church of Mansfield, a member of the Ladies Guild, and Good Neighbors Club. She enjoyed needlework, knitting, sewing, and reading. Marie is survived by her childrenand their spouses, John and Marjorie of Merrimack, NH, Michael and Susan of Ebensburg, PA, Marie and Wallace Blanchard of Marrietta, GA, Catherine and Juergen Seefeldt of Mifflinburg, PA, Timothy and Carolynn of Carrsville, VA, Martin of Conyers, GA, and Daniel, of North Richland Hills, TX. Also surviving are 14 grandchildren and great-grandchildren. In addition to her parents and husband, two sons, Patrick and Stephen, preceded her in death. Family and friends are invited to call at the Scureman Funeral Home on Friday, April 29, 2005, from 9:30 a.m. to 10:50 a.m. A recitation of the Rosary will be at 10:50 a.m. at the funeral home. A Mass of Christian burial will be held at the Holy Child Church of Mansfield at 11:30 a.m. on Friday, April 29, 2005, with the Father Albert Leonard as celebrant. Interment will be at St. Andrews Cemetery in Blossburg, PA. Memorials in Marie's name may be made to the Holy Child Ladies Guild, 237 South Main Street, Mansfield, PA 16933. Arrangements have been entrusted to the Scureman Funeral Home Inc., 130 South Main Street, Mansfield, PA 16933. DEITLER, Joseph – Joseph Deitler died March 20 at the home of his son-in-law, George S. Richter, in Blossburg. He was 70 years of age and was a well-known and highly esteemed citizen. He formerly resided at Mansfield, going to Blossburg following the death of his wife a few months ago. The funeral was held March 24 from St. Andrew’s church at Blossburg, Rev. M.J. Kelly officiating. Interment was made in St. Andrew’s cemetery. Mr. Deitler is survived by one daughter, Mrs. George S. Richter, of Blossburg, and one son, Frank Deitler, of Philadelphia. Wellsboro Agitator, 2 April 1919. DELINSKI Edward Joseph, Sr. Age 92, formerly of Blossburg and Williamsport, PA, died, July 3, 2005 in Harrisburg, PA. Ed was predeceased by his beloved wife, Mary in 1999. Surviving are his daughter, Tina and her husband, John Eckert of Harrisburg, PA; his son, Edward Delinski, Jr. of Covington, PA; several grandchildren and great-grandchildren. A private graveside service was held in the St. Andrew's Cemetery in Blossburg with Father Albert Leonard, officiating. Arrangements were in the care of Zwicharowski's, Blossburg, PA.
Mrs. Catherine Devine Gannon, wife of Martin Gannon, died at her home in Morris Run on January 17. She was born in Wolverhampton, Staffordshire, England, on March 27, 1857, and was married to Martin Gannon in 1878. She came to America in 1882, settling in Fall Brook, where she .resided until 1899, when she moved to Morris Run, where she resided until her death. Besides her husband, Mrs. Gannon leaves three sons and five daughters, Mrs. Thomas F. Dwyer, of Morris Run; Mary, Nellie, Anna and Margaret, at home; John, of Elmira, N. Y.; Michael, of Rochester, N. Y., and Martin, Jr., of New York city. Funeral services were held at St. Joseph's Catholic church Jan. 20. High mass of Requiem was celebrated by Rev. Thos.A. Needham. Interment was In St. Andrew's Catholic cemetery in Blossburg. The following acted as pallbearers: Simon O'Dea, W. F. O'Donnell, W. G. Hayes, A. J. Coleman, James Sheridan and John Moriarlty. Thomas Coogan, A. J. Somerville,Frank O'Dea, Raymond Husted, Frank Guirey, Thomas Moriarity, Hugh MacEwan and William Mclntire were flower bearers. DOWLING –BETTY J. BAKER, 64, Roaring Branch RD 1, diedJuly 26, 1991, at the Troy Community Hospital. Mrs. Baker was born September 19, 1926, in Morris Run, a daughter of William and Rose Bubacz Dowling. She was a homemaker. Mrs. Baker was a member of St. Andrew’s Catholic Church. She is survived by her husband of 45 years, Frank S. Baker; two sons Ronald Dowling, Blossburg and Frank A. Baker, Mainesburg; three daughters, Mrs. Rose Ann Parker, Ridgely, MD, Mrs. Barbara Griswold, Ogdensburg, and Mrs. Wendy Barnes, Morris Run; and nine grandchildren. She was predeceased by two sons, Thomas in 1977 and Joseph in 1978. A Mass of Christian Burial was held Monday at St. Andrew’s Catholic Church, Blossburg, with the Rev. Thomas Shoback, her pastor, officiating. Interment was in St. Andrew’s Cemetery. Funeral arrangements were under the direction of the Adams-Morse and Kleese Funeral home, Blossburg. –Canton Independent Sentinel. Aloysius J. Dreas, prominent Mansfield business man, died unexpectedly of a heart attack early Monday morning at his home on South Main Street. The son of Mr. and Mrs. Leo Dreas, he was born February 13, 1899, in Blossburg, where he spent his early life. He learned the meat cutter's trade and was employed for several years in Blossburg before going to Elmira, where he conducted a market. Six years ago he came to Mansfield and opened the market on Wellsboro Street. Mr. Dreas' sincere friendliness and integrity won for him hosts of friends in Mansfield and vicinity, which is attested by his excellent business success. He gave generously of his time and money whenever he was called upon and was never too busy with his own problems to help a fellow-man. He was a member of St. Andrew's Catholic Church and Knights of Columbus of Blossburg and Austin-Cox Post, American Legion, of Mansfield. Funeral services will be held Thursday at 9 a.m. in St. Andrew's Church, Blossburg, the Rev. Thomas Ahern officiating. Burial will be in St. Andrew's Cemetery. Austin-Cox Post, American Legion, will conduct military services at the cemetery. Surviving are his wife, Mrs. Ida Manikowski Dreas; two brothers, Leo and Val Dreas, of Rochester, and four sisters, Mrs. Walter Lucas and Ms. Francis Williamson, Rochester; Mrs. Louis Manikowski, Blossburg, and Mrs. Welch Cleveland, Mansfield, and several nephews and nieces. DWYER –HELEN MANIKOWSKI, 81, of Blossburg, died Saturday Nov. 27, 2004 at the Arnot Ogden Medical Center, surrounded by her loving family. Born Nov. 8, 1923, in Blossburg, she was the daughter of the late Thomas and Katherine Gannon Dwyer. She was married to Fabian Manikowski, who preceded her in death. Helen was a devoted mother and a caring and dedicated educator. She was a retired teacher from North Penn School. She was a member of the Blossburg Area Catholic Community, Altar and Rosary Society of St. Andrews, P.S.E.R.S., Blossburg BPW, Tioga County Republican Women and former member of the Alumni Board of Mansfield University. Surviving are four children, Mary Helen (Larry) Hayes, of Avon, N.Y., Patricia (David) Robbins, of Binghamton, N.Y., Jeanne (James) Osterman, of Southlake, Texas and AnneMarie (Allen) Manikowski-Bailey, of Horseheads, N.Y.; seven grandchildren, Jeanie, Christy and Katie Hayes, Marissa Robbins, Michael and Elizabeth Osterman and Mackenzie Bailey; a special niece, Jane Becker; a grand nephew, Jacob Becker; and several other nieces and nephews. In addition to her parents and husband, Helen was preceded in death by a daughter, Joan Manikowski; daughter; Joan Manikowski; three brothers, Martin, Thomas and John Dwyer; two sisters, Catharine Brown and Marceil Keiffer. Friends will be received from 60 to 9 p.m. Tuesday, Nov. 30 at the Freeberg Funeral home, 120 N. Williamson Rd., Blossburg. A vigil service will be held at 8 p.m. Transferal prayers will be at 9:30 a.m. Wednesday at the funeral home. Funeral Mass will follow at 10 a.m. at St. Andrews Church in Blossburg, with Father Brian Clarke as celebrant. Burial will follow at St. Andrew’s Cemetery. Donations may be made to the American Diabetes Association. –Williamsport Star-Gazette. Clarence J. Every, 86, of Mansfield RD 3, died Friday, June 23, 1978, in Soldiers and Sailors Memorial Hospital, Wellsboro. Born January 11, 1892, in Blossburg, he was a son of James and Polly Cleveland Every. Mr. Every was a retired farmer and cattle dealer. He was a member of Holy Child Catholic Church. He was a member of the Sullivan Grange of Mainesburg and had been a farmer and a cattle dealer all of his life. He was preceded in death by his first wife, Mary E. Every in 1975. He is survived by his wife, Iva Smith Every, at home; sons, James Every of RD 3, Mansfield; Joseph Every of Elmira, NY. ; daughters, Mrs. Frances Thompson of Lebanon, Pa.; Mrs. Betty Hogan of Harrisburg; Mrs. Joan Whitman of Lebanon, Pa.; brother Raymond Every of S. Waverly, Pa.; sisters, Mrs. Viola Haley of Waverly; Mrs. Ethel Enderle of Mansfield; Mrs. Eva Williams of Sayre; Miss Veva Everly of Danville; six grandchildren; five great grandchildren; nine step-grandchildren. A mass of Christian Burial was held in the Holy Child Church at Mansfield on Monday with Rev. Joseph Houston as the Celebrant. Burial was in the St. Andrews Cemetery at Blossburg. Age 86 of RD 3, Mansfield, Pa., Friday, June 23, 1978 at the Soldiers & Sailors Memorial Hospital, Wellsboro, Pa. Friends are invited to call at the Auld Funeral Home, Blossburg, Pa., Sunday from 2 to 4 and 7 to 9 pm. A mass of Christian Burial will be offered in the Holy Child Church of Mansfield, Pa., Monday at 11 am., Rev. Joseph Houston Celebrant. Recitation of the rosary at the funeral home, Sunday evening at 8 pm. Burial in St. Andrews Cemetery, Blossburg, Pa. Survived by wife, Iva Smith Every, at home: sons, James Every of RD 3, Mansfield, Pa., Joseph Every of Elmira, NY; daughters, Mrs. Frances Thompson of Lebanon, Pa., Mrs. Betty Hogan of Harrisburg, Pa., Mrs. Joan Whitman of Lebanon, Pa.; brother, Raymond Every of S. Waverly, Pa.; sisters, Mrs. Viola Haley of Waverly, Pa., Mrs. Ethel Enderle of Mansfield, Pa., Mrs. Eva Williams, of Sayre, Pa., Miss Veva Everly of Danville, Pa.; six grandchildren; five great grandchildren; nine stepchildren. He was a member of the Holy Child Church of Mansfield, Pa. He was member of the Sullivan Grange of Mainesburg, Pa. and had been a farmer and a cattle dealer all of his life. He was preceeded in death by his first wife, Mary E. Every in 1975. EVERY – Clarence J. (C.J.) Every, (SRGP 13378) age 86 of Mansfield RD3, died Friday, June 23, 1978 at the Soldiers & Sailors Memorial Hospital, Wellsboro, PA. Friends are invited to call at the Auld Funeral Home, Blossburg, PA, Sunday from 2-4 and 7-9 PM. A mass of Christian Burial will be offered in the Holy Child Church of Mansfield, PA, Monday at 11 AM, Rev. Joseph Houston Celebrant. Recitation of the rosary at the funeral home, Sunday evening at 8 PM. 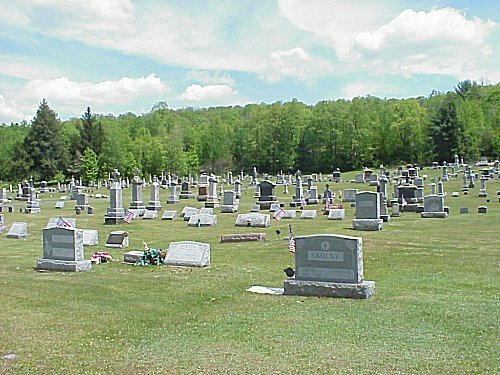 Burial in St. Andrews Cemetery, Blossburg, PA. Survived by wife, Iva Smith Every, at home; sons, James Every of Mansfield RD3, Joseph Every of Elmira, NY; daughters, Mrs. Frances Thompson of Lebanon, PA, Mrs. Betty Hogan of Harrisburg, PA, Mrs. Joan Whitman of Lebanon, PA; brother, Raymond Every of S. Waverly, PA; sisters, Mrs. Viola Haley of Waverly, PA, Mrs. Ethel Enderle of Mansfield, Mrs. Eva Williams of Sayre, PA, Miss Vera Every of Danville, PA; 6 grandchildren; 5 great grandchildren; 9 step-children. He was a member of the Holy Child Church of Mansfield, PA. He was member of the Sullivan Grange of Mainesburg, PA and had been a farmer and a cattle dealer all of his life. He was preceded in death by his first wife, Mary E. Every in 1975. EVERY Joseph R. (SRGP 27386) Age 85, of R.D. 4, Troy, PA, died Thursday, September 8, 2005, at his brother's home in Mansfield, PA (Actually in Richmond township on Sullivan Township border). Joseph was born on October 22, 1919 a son of Clarence and Mary Every. Joseph was a member of St. John's Nepomucene Catholic Church. He was a U.S. Army veteran, having served in WWII. Joseph is survived by one brother, James Every of Mansfield, PA; one nephew, Dennis Hogan of Etters, PA; several great-nieces and nephews. Three sisters, Frances, Mary Elizabeth, and Joan, preceded him in death. Family and friends are invited to call on Monday, September 12, 2005, from 6 p.m. to 8 p.m. at the Jacquelyn A. Buckheit Funeral Chapel, Crematory & Monuments, PC, 637 South Main Street, Mansfield, PA. A Mass of Christian Burial celebrating Joseph's life will be held on Tuesday, September 13, 2005, at 10 a.m. at the Holy Child Catholic Church, South Main Street, Mansfield, PA, with The Rev. Albert Leonard as Celebrant. Burial will be in St. Andrew's Catholic Cemetery, Blossburg, PA.
JOSEPH R. EVERY, 85, Troy RR 4, died September 8, 2005 at his brother’s home in Mansfield. Born on October 22, 1919, he was the son of Clarence and Mary every. He was a member of St. John’s Nepomucene Catholic Church. He was a U.S. Army veteran having served in World War II. Surviving are brother, James Ever, Mansfield, PA; nephew, Dennis Hogan, Etters, PA; and several great-nieces and nephews. Sisters, Frances, Mary, Elizabeth and Joan preceded him in death. A Mass of Christian Burial celebrating his life will be held Sept. 13 at 10 a.m. at the Holy Child Catholic Church, South Main St., Mansfield, PA with the Rev. Albert Leonard as celebrant. Burial will be in St. Andrew’s Catholic Cemetery, Blossburg, PA. Arrangements were under the direction of the Jacquelyn A. Buckheit Funeral Chapel, Crematory and Monuments, PC, 637 S. Main Street, Mansfield, PA. –Canton Independent Sentinel. FREDERICK - HARZINSKI, Isabelle R.
GOLDEN, William – William Golden, of Blossburg, died Friday morning following a brief illness from stomach trouble. His illness was not thought to be of a serious nature until the past few days, when complications developed. Mr. Golden was 60 years of age and his entire life was spent in Blossburg, where he was born. He was one of Blossburg’s leading and progressive business men and was best known through the county as a member of the well known firm of coal operators, Golden Brothers, being associated together with his brother, T.J. Golden, in the mining and shipping of coal. The Golden Brothers for 14 years operated for the Morris Run Coal and Mining Company and for several years they have given their attention to the development of their own coal lands south of Blossburg. Extensive improvements were now under way in the development of their fields and the death of Mr. Golden, who was an expert mining man, will be keenly felt. He was a man of genial disposition, and his upright business methods made him friends by the score. He is survived by two sisters, Celia, at home, and Nora, of Boston, and one brother, T.J. Golden, of Blossburg. The funeral was held from St. Andrew’s Catholic church Monday morning Rev. M.J. Kelly officiating; burial in St. Andrew’s cemetery. Wellsboro Agitator, 21 May 1919. GRAVES - Fred L. Graves, editor and publisher of the Tioga Argus, is the recipient of general sympathy in his bereavement through the loss of his estimable wife, who fell dead last Sunday morning while engaged in household duties. The news of her sudden decease could hardly be credited by her numerous friends, so unexpected was the stroke. She complained of not feeling well when she arose in the morning, and this was the only warning of the sad event which followed a few moments later. Mrs. Graves's maiden name was Maggie Lanane, and her relatives are respected residents of Fall Brook. She leaves six small children, who as yet cannot realize their great loss. Deceased was a devoted mother, a consistent Christian and a woman who was accorded and thoroughtly deseved the respect and esteem of all who knew her. Her age was 32 years. The funeral was held at St. Andrew's Catholic Church in Blossburg Tuesday, and was largely attended, after which the remains wre tenderly consigned to the earth in the Catholic cemetery. MISS GENEVIEVE GERNON: Miss Genevieve Gernon, of Granger Street, Blossburg, and Elmira, N.Y., died Friday, Dec. 7, 1973, in the Arnot-Ogden Hospital, Elmira, where she had been a patient for several weeks. Miss Gernon was born at Blossburg. She was a member of St. Patrick’s Catholic Church, Elmira, and a member of the church’s woman’s club. She was also a member of the Current Events Club, Blossburg. Surviving are two sisters, Miss Elizabeth Gernon, with whom she lived at Elmira, and Mrs. Marguerite Lewis, of Berwick. A prayer service was at 9:30 a.m. Monday in the church followed by the funeral at 10 a.m. Burial was in St. Andrew’s Cemetery, Elmira. Mrs. Lenore Mitchell, 70, wife of Victor Mitchell, of Covington, died Tuesday, May 15, 1973, in the Robert Packer Hospital, Sayre. She was born in Morris Run on Aug. 4, 1902, a daughter of William and Rose McMahon Hayes. Mrs. Mitchell was a member of the Holy Child Catholic Church, Mansfield. Surviving, besides her husband, are two sons, William, of Morrisbille, and Robert, of Apalachin, NY; a daughter, Mrs. Lillian Ranniawicz, of Elmira, NY; a brother, Bernard Hayes, of Mansfield, and 10 grandchildren. The funeral was held Friday in the church. Burial was in St. Andrew's Cemetery, Blossburg. The Rev. F. Allan Conlan, her pastor, officiated. Lenora, age 70, of Canada Road, Covington, Pa., Tuesday, May 15, 1973 at the Robert Packer Hospital, Sayre. Friends may call at the Kuhl Funeral Home, Mansfield, Thursday 2 to 4 and 7 to 9 p.m. Recitation of the Rosary Thursday 4 p.m. Mass will be held Friday 9:30 a.m. in Holy Child Catholic Church, Mansfield, Rev. F. A. Conian officiating. Burial in St. Andrew’s Cemetery, Blossburg, Pa. 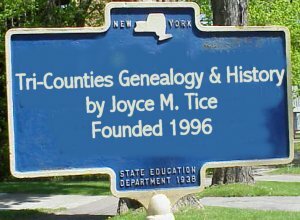 Survived by husband, Victor a Mitchell; two sons, William of Morrisville, Pa. and Robert of Apalachin, N.Y.; one daughter, Mrs. Theodore (Lillian) Raniewicz of Elmira; 10 grandchildren; one brother, Bernard Hayes of Mansfield. She was a member of Holy Child Catholic Church, Mansfield. (from a second article)ef. She was born in Morris Run on Aug. 4, 1902, a daughter of William and Rose McMahon Hayes. JANKOWIAK Irene Age 74, of Blossburg, PA, died Tuesday, March 14, 2006, at The Green Home, Wellsboro. Born October 23, 1931 in Blossburg, she was a daughter of the late Andrew and Cecelia (Zodrynski) Jankowiak. Irene graduated from Blossburg High School in 1952. She was employed as a telephone operator first by Commonwealth Phone and later by N. Penn Health Services until retiring in 1996. She was a member of St. Andrew's Catholic Church, Blossburg. Surviving are her sister and best friend, Violet; and a dear friend, Cindy Payne of Mt. Airy, MD; a sister, Lottie Marvin predeceased her. Friends may call today, 2 p.m. to 2:30 p.m. at the Zwicharowski Funeral Home in Blossburg. The funeral will follow at 2:30 p.m. at the funeral home with Rev. Albert Leonard officiating. Burial will be in the St. Andrew's cemetery, Blossburg. In lieu of flowers, memorials may be made to St. Andrew's Catholic Church, c/o 138 St. Mary's St., Blossburg, PA 16912. Lotti M. Of Blossburg, PA Age 74, died, Monday morning, June 5, 2000 at the Broad Acres Nursing Home in Wellsboro, PA. Born August 12, 1925 in Blossburg, she was a daughter of the late Andrew and Cecelia Zodrynski Jankowiak. Lotti was employed as a Dietary Aide by the former Blossburg State Hospital for many years until its closure in 1972. She was a member of St. Andrew's Catholic Church in Blossburg. She is survived by 2 sisters, Irene and Violet Jankowiak, both of Blossburg, PA. She was predeceased by her husband of 40 years, Edward on September 19, 1994. Friends my call from 9:30 to 10 AM, Thursday, June 8, at the WM. Zwicharowski Funeral Home, 314 Granger St., Blossburg, PA. The Funeral Service will immediately follow at 10 AM at the Funeral Home, with her Pastor Rev. Kenneth Seegar, officiating. Interment will be held in the St. Andrew's Cemetery, Blossburg. JOSEPH Charles L. Age 86, of 120 Bleeker St., Blossburg died Monday, September 24 at Soldiers & Sailors Memorial Hospital, Wellsboro. Born on March 9, 1915 in Scranton. The son of Charles Joseph and Margaret Petro Joseph Conforti. He was married to Catherine Husted Joseph who preceded him in death in 1969. He then married Harriet Sindlinger Joseph in August 12, 1978. Charlie was a U.S. Army veteran serving during WWII in the African and European campaigns. He was a member of the Blossburg Area Catholic Community. He retired as manager of the PA State Liquor Store in Mansfield. Surviving are his wife, Harriet of Blossburg; son and daughter-in-law, Michael C. Joseph and Wenyi Ho State College; daughter and son-in-law, Mary M. and John Eckman of Blossburg; grandchildren, John J. Eckman of Williamsport and Amy Eckman of Alexnderia, Virginia; stepchildren, Ron Sindlinger of Muncy and Donna Pepperman of Greenville, NC; six step-grandchildren and ten step-great-grandchildren; brother, Robert Conforti of Berwick; sister, Lucille Gurnari of Scranton. He was preceded in death by his wife Catherine and a sister, Marie Slavinski. A prayer service will be at 9:30 AM on Thursday at Freeberg Funeral Home, 120 N. Williamson Road, Blossburg, followed by a Mass of Christian Burial at 10 AM at St. Andrews Church with Rev. Richard Fox officiating. Interment will be in St. Andrew's Cemetery. Friends will be received at the funeral home on Wednesday from 6-8 PM. A vigil service will be at 6 PM. In lieu of flowers donations my be made to charity of one's choice. Anthony G. Kazlouski, 72, of South Williamson Road, Blossburg, died on Wednesday, September 9 In Soldiers and Sailors Memorial Hos-pital in Wellsboro, following a lengthy illness. Born at Wyoming, Luzerne Coun-ty, on August 13, 1915, he was the son of Charles and Anna Kozlesky. He used a different spelling of the fami-ly name. A Marine veteran, Mr. Kazlouski was a member of Veterans of For-eign Wars Post 8730 and American Legion Post 167 in Morris Run. He was a member of the Hillside Rod and Gun Club and the Over the Hill Gang. A retired railroad freight conduc-tor, he was a life member of the United Transportation Union. Surviving are his wife, Doris of Philadelphia; a son, Anthony C., Jr. of Philadelphia; a sister, Mrs. Marie Capolla of Oradel, N.J.: a brother, George Bender of N.J.; and three grandchildren. A prayer service was conducted at Drinkwine’s Funeral Home, 120 North Williamson Road, Blossburg, followed by a service at St. Andrew’s Catholic Church, Granger Street, Blossburg, Saturday, September 12. The Rev. James McGahagan, church pastor, officiated. KELLY – The funeral was held Monday, Jan. 13, for Francis J. Kelly, 81, of 195 South Main St., Mansfield, a former postmaster in the borough for 32 years, who died Saturday, Jan. 11, 1986, at home. Born at Lambs Creek, Apr. 26, 1904, he was a son of William H. and Margaret Kerwan Kelly. Mr. Kelly was a member of Hold Child Roman Catholic Church. He was a graduate of Mansfield High School and the former Mansfield State University. Mr. Kelly was a former borough councilman. He also was an officer of the Mansfield Businessmen’s Assn. And a member of the Mansfield Public Library Board and the National Assn. Of Retired Postmasters. Mr. Kelly was a former professional baseball player and a longtime manager of Mansfield’s town team and Mansfield Babe Ruth Baseball teams. He was a charter member of Mansfield University’s Sports Hall of Fame Board. Surviving are his wife, the former Lucile Palmer; three step-sons, Richard Kaley of Camilus, NY, John Kaley of Houston, Texas, and Robert Kaley of Milwaukee, Wis.; a sister, Regina Mudge of Mansfield; and 5 nieces and 4 nephews. The funeral was at Hold Child Roman Catholic Church, Mansfield. Burial was in St. Andrews Cemetery, Blossburg. The Rev. John J. Tamalis, his pastor, officiated. Memorial contributions may be made to the American Cancer Society or the Holy Child Roman Catholic Church, Mansfield. Arrangements by the Kuhl-Wilston Funeral Home, Mansfield. Regina M. Mudge, 90, of the Green Home, Wellsboro, formerly of Mansfield, died Tuesday, Oct. 6, 1987, at the Green Home. She was born June 25, 1897, in Lambs Creek, the last of ten children of William and Margaret Kerwain Kelly. A graduate of the Arnot-Ogden School of Nursing, Class of 1921, she was a former head nurse for the Kenmore, NY, School District. She was also a private duty nurse and a hospital nursing supervisor in the Buffalo, NY, area. She was a member of the Holy Child Roman Catholic Church in Mansfield. Mrs. Mudge had returned to Mansfield in the 1960s after living in Paterson, NJ, for over 20 years while her husband was a supervisor for the Curtis Wright Aircraft Engine Corp. Her husband, Earl Mudge, died in 1963. She is also predeceased by two brothers, Francis and Harold Kelly, and one sister, Mrs. Henry Korb, who were long-time local residents. She is survived by several nieces and nephews. Friends called at the Wilston Funeral Home, Mansfield, Friday, Oct. 9. Funeral services were held Saturday, Oct. 10, at the Holy Child Church in Mansfield. The Rev. John Tamalis officiated. Burial was made in St. Andrew's Cemetery in Blossburg. Mrs. Margaret MADIGAN died Dec 14 at her home in Elmira, following an illness of a few days. She was born in Ireland 74 years ago. She came to this country when she was 15 years of age. She was married to Patrick Madigan of Towanda. Most of her married life was spent in Arnot, PA where she lived until 15 years ago, when she moved to Elmira. Mr. Madigan died 17 years ago. Surviving are eight children: Mrs. Edward Dugan of Sayre, PA; Mrs. Edward Hayes of Corning, NY; Mrs. Luke Margraff of New York; Nora, Sadie and Clara Madigan at home; Thomas of Corning; and Anthony of Elmira and one brother, John Kennedy of New York City. Interment at St. Andrew’s Catholic cemetery at Blossburg. Mrs. Margaret B. Kelly died at her home in Lambs Creek Saturday morning after an extended illness. She was born in Corning, N. Y., November 25, 1860. She moved to Blossburg at the age of three, where she resided until her marriage to the late William H. Kelly June 25, 1885. Survivors are daughters, Mrs. James E. Kelley, Corning, NY., Mrs. Elizabeth H. Woods, Elmira, NY., Mrs. Earl Mudge, East Patterson New Jersey, Mrs. Henry Korb, Mansfield; sons Hugh C. Endicott, NY.,William L., Fairlawn , NJ., Stuart V., Elmira, NY.,Harold F. And Francis J. Of Mansfield; brother, Michael A. Kerwan, Elmira, NY., ten grandchildren and four great grandchildren. Funeral service was held at St. Andrews Church in Blossburg, Tuesday at 9:30 a.m. Burial at St Andrews Cemetery. Mrs. Anna K. Lynch, aged 63 years died Wednesday, Dec. 23, at the Foltz home, Wellsboro, R. D. 4. She was born in Liberty, March 9, 1866, the daughter of William and Sarah Bryan King and was the widow of John Lynch. Surviving are a daughter, Mrs. Loretta Rexford, of Gaines, R. D.; a son, Eugene, Naval officer, serving in the Pacific; a sister, Mrs. Bertha Critten, of Elmira, and six grandchildren. The funeral was held Saturday at St. Peter’s Catholic church, Rev. Thomas Kelly officiating, burial in Blossburg. Mrs. Frances Warren, 81, wife of James R. Warren, of 311 Granger Street, Blossburg, died Thursday, Oct. 8, in Arnot Ogden Memorial Hospital, Elmira, NY. Born Sept. 17, 1906, at Blossburg, she was a daughter of John J. and Mary Birmingham Leonard. Mrs. Warren, retired in 1968 as a teacher at Blossburg Elementary School. She was a member of St. Andrews Catholic Church and its Altar and Rosary Society. Surviving, besides her husband, are a son, James A., of Blossburg, and a sister, Sister Katherine Ignatius, of Dallas. Friends called at Drinkwine's, 120 North Williamson Road, Friday, Oct. 9. Funeral services were held Saturday, Oct. 10, at the church, 314 Granger Street, Blossburg. The Rev. James McGahagan, her pastor, officiated. Burial was made in the church cemetery. John Lynch died in a hospital in Philadelphia last Saturday week. The remains were brought here last Tuesday and funeral services were held Wednesday; interment in the Catholic cemetery, Blossburg, Rev. Dr. Lucas officiating. The deceased leaves a widow and two small children, who reside at Jersey Shore, besides his mother, three brothers and two sisters in Arnot. Patrick MADIGAN, of Arnot, died last Tuesday morning at the home of his daughter, Mrs. Edward Dugan, of Sayre, where he had gone the previous Saturday for a visit. His remains were taken to Arnot Wednesday Noon. Funeral services were held Friday morning at the Catholic church of Arnot, Rev. Dr. Lucas of Blossburg, celebrating a requiem high mass. Interment was made at St. Andrew’s Catholic cemetery at Blossburg. Mr. Madigan was about 65 years old and had resided in Arnot for a number of years, where he was highly esteemed. Besides his wife, he is survived by seven daughters: Misses Nora and Marguerite of Arnot, Mrs. Edward F. Hayes and Miss Clare Madigan of Corning, NY, Mrs. Edward Dugan of Sayre, Misses Katherine and Sarah Madigan of Elmira, NY and two sons, Thomas Madigan of Corning, NY and Anthony Madigan of Sayre. Marcella Loretta (Manikowski) "Soper" Age 90, died on Saturday, October 9, 2004, at the Bradford County Manor in Burlington, PA. Marcella was born on October 28, 1913, the daughter of the late Louis and Margaret Manikowski. Marcella was employed by Tri-County Rural Electric as an Account Manager until she retired. She was a member of the Holy Child Catholic Church, a charter member of the Holy Child Guild, a charter member of the Mansfield Hose Co. Auxiliary, the American Legion Auxilary #246 of Athens, PA, Mansfield Garden Club and a charter member of the Mansfield Area 55 Plus Group. Marcella is survived by a daughter, Ernestine A. McDermott of Athens, PA; a son, Leo J. Soporowski of Cottontown, TN; sisters, Mrs. Angie Bubacz of Blossburg, PA, Mrs. Margaret Payne of Blossburg, PA, Mrs. Monica Hughes of Lawrenceville, PA, Mrs. Martha Jessup of Lawrenceville, PA; six grandchildren; three great-grandchildren; and several nieces and nephews. In addition to her parents, Marcella is preceded in death by her husband, Stanley G. Soporowski; brothers, Marjin "Moe" Manikowski, Leo J. Manikowski, Louis Manikowski, Raymond Manikowski and Matthew Manikowski. Family and Friends are invited to call at the Scureman Funeral Home, Inc, 130 South Main Street., Mansfield, PA, on Monday, October 11, 2004 from 2:00 p.m. to 4:00 p.m., with a Reciting of the Rosary at 3:30 p.m. A Prayer Service will be held at the Scureman Funeral Home on Tuesday, October 12, 2004 at 9:30 a.m. A Mass of Christian burial will be held on Tuesday, October 12, 2004 at 10:00 a.m. at the Holy Child Catholic Church, 237 South Main Street, Mansfield, PA, with the Father Albert Leonard as celebrant. Interment will be at St. Andrews Cemetery in Morris Run, PA. Memorial Contributions may be made in Marcella's name to the Mansfield Ambulance Association, Mansfield, PA.
Victoria A. Manikowski, 89, of Bleeker St., Blossburg, diedWednesday, Feb. 18, 2004 while visiting at the home of her daughter, Barbara in San Mateo, Calif. She was born Victoria Marchines on Dec. 18, 1914, in Olyphant. Friends called Wednesday, Feb. 25 at the Zwicharowski Funeral Home, Blossburg where a vigil service was held. Transferal Prayers were offered on Thursday, Feb. 26 followed by a Mass of Christian burial with pastor, the Rev. Brian Clarke, officiating. Burial was made at St. Andrew's Cemetery, Blossburg. Memorials may be made to the Blossburg Memorial Library, 307 Main St., Blossburg, Pa. 16912. Of Mansfield Saturday December 29, 1973 at Robert Packer Hospital in Sayre after an extended illness. Friends are invited to call at the family home Monday afternoon and evening. Recitation of the Rosary will be held Monday evening at 9 pm at the family home. Mass of the Resurrection will be held at 10:30 am Tuesday at the Holy Child Catholic Church in Mansfield. Father F.A. Conlan officiating. Burial in St. Andrew's Cemetery in Blossburg. Arrangements by Kuhl Funeral Home in Mansfield. Survived by wife, Margaret Hager McMillen; three sons, James J. of Laurel, Md., J. Paul of Croften, Md., C. Thomas of the Univ. of Maryland; two daughters, Sheila of Johnson, Vt., Mary Elizabeth, at home; one sister, Mrs. Mary Cooper of Rochester, NY; one brother, Bernard of Duneedin, Fla. He was born in Corning, NY, the son of William Henry and Margaret Ruddy McMillen. MANSFIELD – Dr. James J. McMillen, of Covington Road, a local dentist for 43 years, died Saturday, Dec. 29, 1973, in the Robert Packer Hospital, Sayre.A son, C. Thomas, is a basketball star at the University of Maryland and was recently named a Rhodes scholar.Dr. McMillen was born in Corning, N.Y., a son of William Henry and Margaret Ruddy McMillen.Surviving, besides his son, are his wife, the former Margaret Hager; two other sons, James J., of Laurel, Md., and Paul, of Cofton, Md. ; two daughters, Miss Sheila McMillen, of Johnson, Vt., and Miss Mary Elizabeth McMillen, at home; a sister, Mrs. Mary Cooper, of Rochester, N.Y. and a brother, Bernard, of Dunedin, Fla.Burial will be in St. Andrew’s Cemetery, Blossburg, Pa.
MCCARTHY, Jeremiah M. – Jeremiah M. McCarthy, of Corning, one of the best known New York Central Railroad conductors on the Pennsylvania Division, died at the Corning hospital Friday morning as the result of injuries received Thursday afternoon about 2:30 o’clock when he fell down the cellar stairs of his home and fractured his skull. It was found at the hospital that Mr. McCarthy had suffered a fracture at the base of the skull. When first injured he was dazed but later he became unconscious. Thursday afternoon he was engaged in carrying sand from the rear of the house to the cellar, where he intended to do some repair work. He secured two pails of sand and started down the stairs, when he slipped, or caught his foot, and fell forward, striking on his head. Painters and paperhangers who were working in the house heard Mr. McCarthy fall and ran to his assistance. The deceased was born in Addison, 69 years ago, the son of Dennis McCarthy and Elizabeth Mullaney. When a boy he moved with his parents to Blossburg, Pa., where he resided until about 20 years ago. In Blossburg, he married Miss Delia Eley, of that village, and later removed to Corning. Mr. McCarthy, while in Blossburg, had been employed as a railroad trainman. When he removed to cor4ning he took employment with the Fall Brook Railroad as a passenger conductor, continuing in that capacity when the railroad was taken over by the New York Central. For approximately 40 years he had been a passenger conductor. Next September he would have been retired on a pension, as he then would have reached the age of 70 years. The untimely death of Mr. McCarthy brings to a climax a series of distressing and sad incidents that afflicted the family during the past year. One year ago Miss Bessie McCarthy, a daughter, died following an illness of influenza. Sometime before Mrs. McCarthy died under distressing circumstances. It was but a short time afterward that Miss Florence McCarthy, another daughter, was badly burning when her clothing caught fire at her home. She is still confined to Corning Hospital as the result of that accident. The death of Mr. McCarthy now comes as a severe shock to the remaining members of the family and the relatives. Mr. McCarthy was one of the best known conductors on the New York Central, and he had a host of friends all along the road over which he traveled daily. His cheerful attitude, his smile and his genial disposition will always be remembered by those who knew him, says the Leader. The deceased was a member of Corning Council, Knights of Columbus, and of the Brotherhood of Railway Engineers. He was a devout member of St. Mary’s church, which he attended regularly. Mr. McCarthy leaves one daughter, Miss Florence McCarthy; one son, Francis McCarthy, of Australia, and four brothers, Dennis, of Addison; John, of Hornell; Charles, of Orange, N.J.; and James, of Brooklyn, N.Y. The funeral was held Monday morning at 8:30 o’clock at St. Mary’s church; burial in Blossburg. Wellsboro Agitator, 17 December 1919. Jay N. A Loving, Family Man Age 85 of Elmira, NY diedin Buffalo on Saturday March 3, 2007. Jay was born on April 30, 1921, the son of the late William & Sarah Grace McNaney. Jay served his country with the US Army 14th Armored Division during the WWII and later served in the Korean War as a second lieutenant. He earned two Purple Hearts and the Bronze Star. He retired from Kennedy Valve in 1985. His interests included watching the Yankees, ND football and bird watching. Jay was a descendant of a Mayflower passenger. Jay is survived by his wife of 58 years, Elizabeth L. Dimmick, children: Anne McNaney, Mark McNaney, Mary Lynne (Herbert) Furman III, Claire Uhry, Louisa McNaney, Juliana (Kevin) Fitzgerald; grandchildren: Jessica, Joanna, Adam, Erin, Matthew, Sarah, Alexandra, Kieran, Darren, Shannon, Ross; great grandchildren: Andrew, Mark and Chloe and several nieces, nephews and cousins. Relatives and friends are invited to call the McInerny Funeral Home, corner of Water and Walnut Sts. on Tuesday March 6, 2007 from 2-5PM. Mr. McNaney's Funeral Service will be held at the Funeral Home immediately following. Interment will be held at the convenience of the family in Blossburg, PA, at St. Andrew's Cemetery. Memorials may be made to charities of one's choice. MITCHELL, Edward, age 39 of Covington, Pa. Friday, September 1, 1972 at his home. Friends are invited to call at the Shaw & Robena Funeral Home, Mansfield, Pa. Sunday 3 to 5 and 7 to 9 p.m. Funeral services at the Holy Child Church, Mansfield, Pa. Monday 10 a.m. Rev. F. Allan Conian. Burial in St,. Andrew Cemetery, Blossburg. Recitation of the Rosary Sunday at 7 p.m. Survived by his parents, Mr. and Mrs. Victor Mitchell, Covington; brothers, William Mitchell, Morrisville, Pa., Robert Mitchell, Apalachin, N.Y.; sister, Mrs. Lillian Raniewicz, Elmira; several aunts and uncles and several nieces and nephews. MUDGE, EARL G. (SRGP 2576) Earl G. MUDGE, 59, Mansfield, died March 18, 1964 at his home after an extended illness. He was well known for his athletic ability at the local high school and college where he excelled in basketball and football. An outstanding lineman, he was captain of the Mansfield State College football team. After college he played with Corning All-High, one of the strong semi-pro teams of that era. From 1926 to 1939 he was Project Engineer for Tioga, Bradford and Sullivan Counties. In 1940 he joined the management division of Curtis Wright Corporation in Woodbridge, NJ. After 16 years he retired and returned to Tioga County as owner and operator of Mudge Brothers Distributing Company in Blossburg. In 1962, he sold his business and entered partnership with his brother, Cole J. Mudge, in the American Oil Company, Covington, PA. He belonged to Holy Child Church of Mansfield and was a member of the Knights of Columbus of Blossburg and the General Assembly of the 4th Degree K of C of Williamsport and a member of the Mansfield Lions Club. Surviving are his wife, the former Regina Kelly; brother, Cole J. Mudge; sisters Mrs. Gladys Stilwell of Mansfield and Mrs. Florence Smith of Elmira, NY. Funeral was held March 21 from Shaw and Robena Funeral home and Holy Child Church with Father Martin A. Roche officiating. Burial was in St. Andrews Cemetery, Blossburg. Lemuel V. (Pat) Murphy, 81, of the Green Home, Wellsboro, formerly of Blossburg, died Sunday, Nov. 1, at home. Born at Coaldale, Jan. 23, 1906, he was the son of Thomas and Katherine Schovlin Murphy. He was a member of St. Andrew's Roman Catholic Church and the Knights of Columbus, Blossburg. His wife, the former Genevieve Ogden, died in 1968. Surviving are a son, Alfred Murphy of Mechanicsburg; a stepsister, Mrs. Helen DeWire of Tamaqua; and four grandchildren. There was no visitation. Prayers were offered today, Nov. 4, at 10:30 am, at the Drinkwine Funeral Home, Blossburg, followed by a Mass of Christian Burial at 11 am in St. Andrew's Church. The Rev. James E. McGahagan officiated. Burial was made in St. Andrew's Cemetery. NELCOSKIE, Thomas – Thomas Nelcoskie died very suddenly Saturday evening. He had eaten supper and shortly afterward was stricken with heart failure, and passed away before medical aid could be summoned. He is survived by his widow; by three daughters, Mrs. Frederick, of Arnot; Mrs. Keths, of Blossburg, and Kate, of Elmira, and six sons. The funeral will be held Wednesday morning; interment in the Polish cemetery at Blossburg. Wellsboro Agitator, 14 May 1919. NORMAN, Frank L., age 85, of 103 Bleecher Street, Blossburg, died Saturday, November 24, 1973 at the Soldiers and Sailors Memorial Hospital, Wellsboro, after a lengthy illness. Prayer service was held at the Auld Funeral Home at Blossburg, on Tuesday followed by Requiem High Mass at the St. Andrew’s Church in Blossburg. Rev. Robert Nealon celebrant. Burial was in the St. Andrew’s Cemetery, Blossburg. He is survived by his wife, Mrs. Josephine Norman, Blossburg; brother-in-law, Patrick Connolly, Blossburg; sisters-in-law, Mrs. Florence Norman, Corning, N.Y., Mrs. John Norman, San Francisco, Calif; and several nieces and nephews. He was born at Arnot on March 29, 1888, a son of John and Margaret Donlon Norman. He was a member of St. Andrew’s Church of Blossburg. He was a veteran of World War I, a member of the William B. Wilson American Legion Post No. 572 of Blossburg, and a past commander of that post. He had owned and operated the Blossburg Building Supply Co. for a period of 42 years. Recitation of the Rosary was at the funeral home Monday evening. O’DEA Stephen – Stephen O’Dea died June 22 at a sanitarium at Cresson. The remains were taken to the home of his mother Mrs. Marg O’Dea at Morris Run. The funeral was held at St. Joseph’s Catholic church at Morris Run, Rev. M.J. Kelly celebrating a requiem high mass, interment in St. Andrew’s cemetery, Blossburg. He was born in Fall Brook, going to Morris Run with his parents when he was a boy where he had since resided. His mother, one sister, Miss Margaret and the following brothers survive: John, of Olean, N.Y.; Siney, of Blossburg; William, of Rochester, N.Y.; Frank and James, of Morris Run. Wellsboro Agitator, 9 July 1919. O’DEA Stephen – Stephen O’Dea, of Morris Run, died at Cressen, Pa., last week Tuesday, after an illness of a few hours. He is survived by his mother and several brothers and sisters. Wellsboro Agitator, 2 July 1919. Mary C. Anderson, 85, of Adelphi, Md., died Sunday, Sept. 20, at the Washington Adventist Hospital in Tacoma Park, MD. Born April 9, 1902, she was the daughter of Richard and Katharine Bambery O’Donnell. She was a Blossburg native and lived in the Harrisburg area for 40 years. She was predeceased by her husband, William J. Anderson. Surviving are a son, William R. Anderson of Adelphi, Md. And four grandchildren. A Mass of Christian Burial was held today (Wednesday, Sept. 23) at the St. Camillus Church in Silver Springs, Md. Graveside services will be conducted Thursday, Sept. 24, at 10 a.m. in the St. Andrews Cemetery in Blossburg. Father James McGaghan, pastor of St. Andrew’s Catholic Church will officiate. Local arrangements were made by the Adams-Morse Kleese Funeral Home in Blossburg. Memorial donations may be made to the St. Camillus- St. Vincent de Paul Society, 1600 St. Camillus Drive, Silver Springs, Md. 20903. Mrs. Arlene O. Brandt, 76, of Riverside Park, Blossburg, died Tuesday, Feb. 12, 1974, in Arnot-Ogden Hospital, Elmira, N.Y., following a brief illness. She was the widow of William R. Brandt. She was born in Arnot on June 9, 1897, a daughter of Edward and Helen O'Heron. Mrs. Brandt was a member of St. Andrew's Catholic Church. There are no immediate survivors. Mrs. Brandt was the aunt of Mrs. Helen O'Donnell, of Elmira. The funeral was at 9 a.m. Friday at the Adam Funeral Home, 303 Main Street, with further services in the church at 9:30. Burial was in the church cemetery. The Rev. Robert L. Nealon, her pastor, officiated. Brandt, Mrs. Arlene age 77, of Riverside Park, Pa., Tuesday, Feb. 12, 1974, at the Arnot Ogden Hospital, Elmira. Friends may call at the Adams Funeral Home, Blossburg, Pa., Thursday 7 to 9 p.m. Prayer service there 9 a.m. Friday, further services at 9:30 a.m. in St. Andrews Church, the Rev. Robert L. Nealon officiating. Burial St. Andrews Cemetery, Blossburg, Recitation of the RosaryThursday at 8:00 p.m. Survived by niece, Mrs. Helen O’Donnell of Elmira. PALMER – Clifford C. Palmer Sr., age 51, of Mansfield, died Saturday, Feb. 22, 1964. He attended Covington Baptist Church; owner of Palmer Trucking, Mansfield. Survived by wife, Mrs. Rose Donegan Palmer; son, Clifford Jr. of Mansfield; daughter, Mrs. Patricia Ann McIntosh of Covington RD; parents, Mr. & Mrs. Cecil Palmer; brothers, LaRue and Claude, all of Mansfield; sister, Mrs. Virginia Baggelaar of Richmond Hill, NY. Funeral was held at Shaw & Robena Funeral Home on Tuesday at 1:30 PM, the Rev. Hyman Vann officiating. Burial was in St. Andrews Cemetery, Blossburg. The funeral was held on Sat-urday for William Passmore, 64, of Elmira, N.Y., a native of Blossburg, who died Wednes-day, Nov. 15, 1972, in St. Jo-seph’s Hospital, Elmira. He was a son of Alfred and Pearl Lewis Passmore. Mr. Passmore was a retired employe of the Thatcher Glass Manufacturing Co., Elmira. He lived in Blossburg for many years. Surviving are his wife, the former Eva Marie Swinsick; two daughters, Mrs. Judith Kadlee, of Big Flats, N.Y., and Miss Sharon Passmore, of El-mira; a brother, Alfred, of Blossburg, and two sisters, Mrs. Vivian Murray, of Natrona Heights, Allegheny County, and Mrs. Elizabeth Waterman, of Pinellas, Fla. Burial was in St. Andrew’s Cemetery, Blossburg. Marcella V. "Sally" Skelly, 77, of Millerton died Tuesday, Oct. 10, 2000, at Strong Memorial Hospital, Rochester, N.Y. Born July 27, 1923, in Roaring Branch, she was the daughter of Fred and Edna Kobbe Reed. She was a 45-year retiree of Corning Glass Works. She was an avid fan of Williamson High School sports and enjoyed flea markets. Preceding her in death were her husband, Harry, in 1976; one son, Harry Jr. (Butch) Skelly; one son-in-law, Ted Elwell; two daughters-in-law, Claudette Laurent and Sandy Bloom; and nine brothers and sisters. Surviving are two daughters and son-in-law, Rose Elwell of Keller, Texas, and Irene and Bill McNeill of Troupsburg, N.Y.; five sons and daughters-in-law, William and Molly Skelly of Nelson, Gene Skelly of Millerton, Tom and Cheryl Skelly of Williston, Fla., Lynn and Debbie Skelly of Tioga and Terry and Mary Skelly of Azle, Texas; 24 grandchildren; 31 great-grandchildren; five brothers, Dan and James Reed of Linden, Carl and Leroy Reed of Liberty and Fred Reed of Canton; five sisters, Marjorie Lusk, Mary Brion and Lydia Roupp, all of Williamsport, Elma Fulkerson of Liberty and Betty Reibson of Forksville. Calling hours were held at the Wilston Funeral Home, Mansfield, on Friday, Oct. 13. A mass of Christian burial was held Saturday, Oct. 14, at Holy Child Catholic Church, Mansfield, with the Rev. Louis Kaminski officiating. Burial was made at St. Andrews Cemetery, Blossburg. Memorial donations may be made to the Lawrenceville Ambulance Association, Lawrenceville, Pa. 16929; or the Millerton Ambulance Association, Millerton, Pa. 16936. ROBAKOWSKI Sylvester Age 84, of Blossburg, PA, died August 22, 2005. Surviving are a sister-in-law, Irene Robakowski of Blossburg; four nieces, Janet Heath of Galeton, Suzanne Wheeler-Conson of Pen Yan, NY, Dolly Augustine of The Green Home in Wellsboro, Anne Riles of Williamsport; five great-nieces and nephews; and eight great-great nieces and nephews. Calling hours are 7 to 9 p.m. Friday at Zwicharowski's in Blossburg. Transferal prayers are 9:30 a.m. Saturday followed by a 10 a.m. Funeral Mass at St. Mary's Catholic Church, Blossburg. Burial will be in St. Andrews Cemetery. ROBENA, John A. John A. Robena died at the family home in Blossburg March 23, following a brief illness from pneumonia. He was 58 years of age and was one of Blossburg’s most progressive business men. He was the owner of several of Blossburg’s business blocks and always took pride in keeping his property in the best of condition and satisfying to his several tenants. Being the lessee of the postoffice premises, he was especially proud of the new equipment which was installed a short time ago and on which he was given a ten year lease by the government. “Jack”, as he was affectionately called, will be greatly missed by a large circle of friends in Blossburg and throughout the county. He is survived by his widow, who formerly was Miss Margaret Mulcahay of Elmira and one daughter, Mrs. W. K. Youdas, of Blossburg. The funeral was held Wednesday morning at nine o’clock from St. Andrew’s Catholic church. Wellsboro Agitator, 2 April 1919. John Lewis ROBENA, died at his home in Arnot, October 31, 1918, of pnuemonia, following influenia. He was born April 4, 1872 , at Arnot, and was one of it's best citizens, well known and universally liked, and his many friends sincerely mourn his loss, Besides his wife Barbara McLean Robena, and one daughter, Nellie Rose, he is survived by his mother, Mrs Rose Besanceney Robena, of Rochester, N.Y. ; two brothers, Amos, of Rochester, and Francis ,of arnot; four sisters, Mrs John Lynch, of Arnot, Mrs. John Hurley and Misses Sadie and Mary Robena, of Rochester, N.Y.. Buried Saint Andrews Cemetery, Blossburg. Amos F. ROBENA died on Monday June 27, 1921 at the family residence no. 151 Penn Street, aged 37 years. He leaves his wife Nina Parker Robena; four daughters, Clarabell, Kathryn, Sadie and Lorraine; one son Edward; his mother Mrs Rose Besanceney Robena, four sisters, Mrs. Rose Hurley, Miss Sadie and Mary Robena of this city, and Mrs. Julia Lynch and one brother Francis Robena , of Arnot, Pa. Interment in Arnot, Pa. on Thursday, June 30, 1921. Amos is actually buried in the St Andrews Cemetery, Blossburg, Pa.
Sunday Democrat and Chronicle, Rochester, N.Y.
ROBENA- Bethune, Mary R. Bethune, died Nov. 20, 1981, survived by her brother , Francis Robena, several nieces and nephews. No prior calling, Mass of Christian Burial 9a.m. Monday in the chapel of St. Ann's Home. Interment, St. Andrews Cemetery, Blossburg, Pa. Arrangements: Farrell Brothers. Mrs. Rose Cunningham, age 88, of Brooklyn, N.Y., formerly of Blossburg, died Tuesday, May 8, 1973 in Brooklyn. Following calling hours in Brooklyn Thursday evening, she was brought to the Olthof Funeral Home for a prayer service Friday morning at 10 a.m. followed by a Funeral Mass in St. Andrew's Roman Catholic Church, Blossburg. Burial was in St. Andrew's Cemetery, Blossburg. She is survived by daughters, Mrs. Rose Abbott of Hampton Bays, N.Y. and Mrs. Betty Caporaso of Hampton Bays, Mrs. Mary Moran of Brooklyn, Mrs. Margaret Dobies of Burbank, Calif., Mrs. Theresa Warren of Brooklyn, Mrs. Rita Rizzo of Keyport, N.J.; sons, John Cunningham of Mansfield and Hugh B. Cunningham of Pine City; 27 grandchildren; several great-grandchildren. She was a communicant of St. Mark's Roman Catholic Church of Brooklyn and was the widow of Hugh B. Cunningham, Sr.
SMITH - Blossburg Woman’s Body Identified as Mrs. Marian Dwyer: The body of a Blossburg woman was found last Friday afternoon floating on Seneca Lake offshore from Watkins Glen, Schuyler sheriffs deputies said. The woman was identified as Mrs. Marian Dwyer, 48, of Blossburg, wife of John Dwyer. She was born in Arnot on February 16, 1925, a daughter of John and Jennie Luke Frederick. Mrs. Dwyer was pronounced dead at the scene by Dr. William Tague, county coroner. Michael J. Maloney, acting county sheriff, said there was no evidence of foul play. Maloney said two workers at the International Salt Co., Richard Pierce and Lawrence Smith, spotted the body and swam 75 feet to retrieve it. Coroner Tague of Montour Falls withheld a verdict pending a post-mortem examination at Arnot Ogden Hospital. Investigators said the body apparently had been in the water for only a short while. Mrs. Dwyer’s car was found on a dirt road near the point where her body was found at 1:20 p.m. The car was last seen being driven toward the area about 20 minutes earlier, Maloney said. Mrs. Dwyer was a beautician. She was a member of St. Andrew’s Catholic Church and its Altar and Rosary Society. Surviving, besides her husband, are a daughter, Jane, at home, and two brothers, Ambrose Frederick, of Blossburg and John Frederick, of Elmira, N.Y. A private funeral was held at 9:30 an. Monday in the church. Burial was in the church cemetery. The Rev. Robert L. Nealon, her pastor, officiated. Marguerite Dwyer, 91, of Blossburg, died Monday, Nov. 8 at her home. Born July 21, 1913 in Arnot, she was the daughter of Thomas V. and Anna Glasz Tormey. Marguerite married Thomas J. Dwyer who preceded her in death in 1984. She and her husband were the proprietors of the general store in Morris Run. Marguerite was a member of the Blossburg Area Catholic Community. Marguerite is survived by three daughters, Catherine (Sam) Badolato of Rome, N.Y.; Ann (Richard) Clark of Blossburg, Marguerite Bombaski of Blossburg; 10 grandchildren; and 16 great grandchildren. In addition to her husband, she was preceded in death by a sister, Irene Mosso. Friends will be received at Freeberg Funeral Home, Blossburg on Thursday, Nov. 11 from 7 p.m. to 9 p.m.; a Vigil service will be held at 8 p.m. Transferal prayers will be at 12:30 p.m., Friday, Nov. 12, at the funeral home. Funeral Mass will follow at St. Andrews Church in Blossburg at 1 p.m. with Father Brian Clarke as celebrant. Burial will follow at St. Andrews Cemetery. Donations may be made to the Blossburg Area Catholic Community. Margaret E. Horner, 65, of 136 Gulick St., Blossburg, died Wednesday, Dec. 16, at the Soldiers and Sailors Memorial Hospital in Wellsboro. Born Aug. 1, 1922, at Windber, she was the daughter of George and Susan Valent. She was an employee for 18 years with the J.P. Ward Foundry, Blossburg, as a core maker. Mrs. Horner was a member of St. Andrew's Roman Catholic Church and its Altar and Rosary Society. Surviving are her husband of 43 years, John A. Horner; three daughters, Mrs. Francis (Dolly) Augustine of Arnot, Suzanne Wheeler of Mansfield, and Mrs. Ronald (Janet) Heath of Galeton; two sisters, Mrs. Sylvester (Susanna) Robakowski and Mrs. Walter (Ann) Kostecki, both of Blossburg; and five grandchildren. Funeral services were held Friday, Dec. 18, at the Adams-Morse and Kleese Funeral Home, Blossburg. The Rev. James McGahagan, her pastor officiated. Burial was made in the church cemetery. Memorial donations may be made to the St. Andrew's Roman Catholic Church, 314 Granger St., Blossburg, 16912. James R. Warren, 80, of 311 Granger Street, Blossburg, died Wednesday, Oct. 21, at the Williamsport Hospital. Born March 26, 1907, at Windfall, he was the son of LaMarr and Maude Bush Warren. He retired in 1970 after 40 years as a science teacher at North Penn High School, where he also coached basketball and baseball. 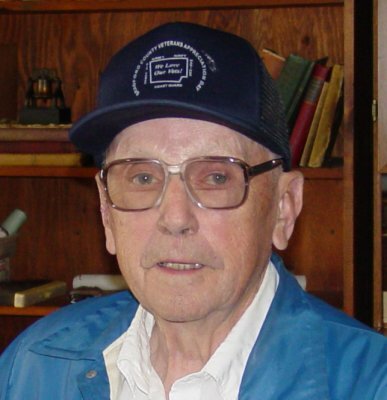 Mr. Warren was a member of the First United Methodist Church in Blossburg and a Charter Member of the Blossburg Kiwanis Club. His wife, Frances, died Oct. 8. Surviving are a son and daughter-in-law, James A. and Janet Warren of Blossburg; a sister, Mrs. Marjorie Dye of Olean, NY; a brother, Arthur Warren of Knoxville; and several nieces and nephews. Funeral and Committal services were held Friday, Oct. 23 at the Drinkwine Funeral Home, 120 North Williamson Road, Blossburg. The Rev. Carl E. Hill officiated. Burial was made in St. Andrews Cemetery, Blossburg. Memorial donations may be made to the First United Methodist Church in Blossburg. Elizabeth M. Wakely, 80, formerly of Covington, died Friday, Oct. 30, at the Green Home in Wellsboro, where she was a resident. Born June 20, 1907, at Franklin, she was the daughter of Edward and Emma Brennan Zeitler. She was a member of the Holy Child Roman Catholic Church and the Holy Child Guild in Mansfield. Mrs. Wakely served as a housemother at the former Mansfield State College. Her husband, John, died in 1961, and a son, James, died in 1951. Surviving are two daughters, Mrs. Bonnie Casselberry of Covington and Mrs. Mary Cooper of Wellsboro; a brother, Edward J. Zeitler of Meadeville; seven grandchildren; eight great-grandchildren; and several nieces and nephews. Funeral services were held Tuesday, Nov. 3, at the Holy Child Church. The Rev. John Tamalis, her pastor, officiated. Burial was made in St. Andrew's Cemetery in Blossburg. Arrangements were made by the Wilston Funeral Home, Mansfield. Memorial contributions may be made in her name to the Holy Child Catholic Church.